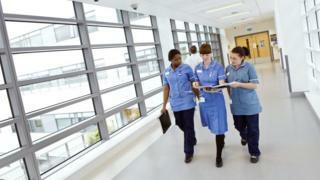 But the NMC said the introduction of English language testing for EU nurses is also likely to have played a role. In May, research by the Royal College of Nursing found one in nine posts in England was vacant. The union said it meant the NHS was 40,000 nurses short of what was needed. The figures - obtained by the Health Foundation under the Freedom of Information Act - cover the numbers applying to go on the register so they do not necessarily mean they are employed by the NHS. But they give an indication of the supply line from the EU which provides a significant proportion of the workforce. Anita Charlesworth, director of research and economics at the Health Foundation, said the drop since the Brexit vote could not be more "stark". "Without EU nurses, it will be even harder for the NHS and other employers to find the staff they need to provide safe patient care. "The findings should be a wake-up call to politicians and health service leaders." The NMC has also drawn attention to the introduction of English language tests, which were brought in for EU nurses for the first time in January 2016 - they were already in use for non-EU nurses. It normally takes a few months from being tested to making it on to the register so officials believe this could have also played a role in the drop in numbers. A Department of Health spokeswoman said EU nurses played a "valued" role in the NHS and they would be a priority in Brexit negotiations. But shadow health secretary Jonathan Ashworth said the government was making a mess of things. "Theresa May's weak and unstable government has pushed NHS services to the brink, and it is patients who will pay the price. "Our health service has always relied on the contribution of overseas workers, yet these staff are being forced out by this government's neglect and disregard. "The Tories are overseeing an unforgivable drain of talent out of our country, because of their chaotic attitude to the Brexit negotiations." And Lib Dem health spokesman Norman Lamb added: "These figures are profoundly worrying and the possible implications for the NHS and patients cannot be underestimated." Overall there are 650,000 nurses on the register. Just over 36,000 of these have been trained in the EU, 5.5% of the total. Another 67,000 come from outside the EU with the rest from the UK.